The objective of this study was to analyze whether obese women with no metabolic syndrome (MetS) have increased cardiometabolic risk compared to non-obese women and to observe the correlations between adiposity and coronary heart disease (CHD) risk factors in metabolically healthy women. 20-40 year old non-obese (n=41), obese with no MetS (n=30) and obese with MetS (n=28) women were studied. Lipid profile, blood pressure, CHD family history, physical inactivity, high-sensitivity C-reactive protein (hs-CRP), fibrinogen, interleukin-1β and tumor necrosis factor-alpha were analyzed. A subset of obese (13) and non-obese (33) women with no major components of MetS (except waist circumference) were further compared. Obese women with no MetS and non-obese women presented a similar metabolic profile that was statistically different from those seen in obese women with MetS. The number of obese women with no MetS and non-obese women presenting two or more risk factors (23.3 and 19.5%, respectively) or presenting high Framingham Risk Score (6.7 and 2.4%, respectively) were also similar. 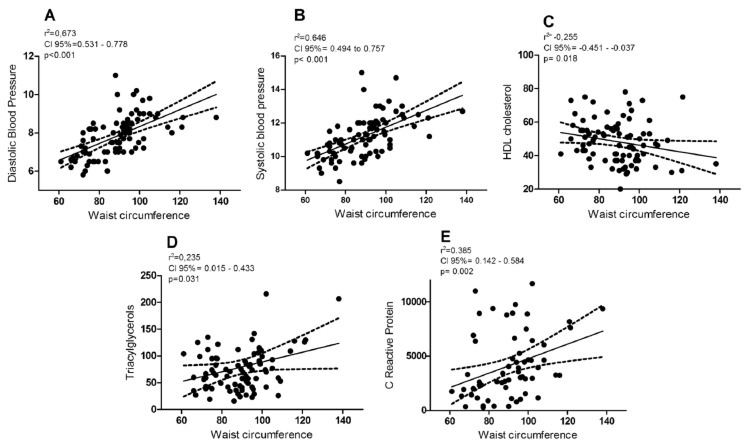 The only pro inflammatory protein correlated to waist circumference was hs-CRP. These data suggest that obesity with no MetS induce a CHD risk comparable to the risk seen in non-obese women. However, when women with no major components of MetS alone were considered, adiposity was positively correlated to blood pressure and hs-CRP. Although CHD risk of obese women with no MetS is closer to non-obese women, adipose tissue expansion was positively correlated to blood pressure and hs-CRP that are important risk factors for CHD. Key words: Adipose tissue, cardiovascular disease, metabolic syndrome, obesity, women. El objetivo de esta investigación fue analizar si las mujeres obesas que no tienen el síndrome metabólico (MetS), tienen riesgo cardiometabólico aumentado comparado con mujeres no obesas y observar las correlaciones entre factores de riesgo de la adiposidad y la enfermedad coronaria del corazón (CHD) en mujeres metabólicamente saludables. Fueron estudiadas mujeres de 20-40 años de edad no-obesas (n=41), obesas sin MetS (n=30) y obesas con MetS (n=28). Se analizaron también factores tradicionales de riesgo y marcadores inflamatorios. Un sub conjunto de mujeres obesas (13) y no obesas (33) sin componentes mayores de MetS fueron comparados adicionalmente. Mujeres obesas sin MetS y mujeres no obesas evidenciaron un perfil metabólico semejante, estadísticamente diferente de lo visto en mujeres obesas con MetS. El número de mujeres obesas sin MetS y no obesas que presentaban dos ó más factores de riesgo (23.3 y 19.5%, respectivamente) ó presentaban riesgo alto con Framingham (6.7 y 2.4%, respectivamente) también fueron semejantes. Estos datos sugieren que la obesidad sin MetS induce un riesgo de CHD comparable al riesgo observado en mujeres no obesas. Sin embargo, cuando las mujeres sin componentes importantes del MetS únicamente fueron llevadas en cuenta, la adiposidad fue correlacionada a la presión sanguínea y a la hs-CRP. Aunque el riesgo de la CHD de mujeres obesas sin MetS sea más próximo al de mujeres no obesas, la expansión del tejido adiposo fue positivamente correlacionado a la presión sanguínea y a la hs-CRP, ambos importantes factores de riesgo para la CHD. Palabras clave: Tejido adiposo, enfermedad cardiovascular, síndrome metabólico, obesidad, mujeres. Obesity is a risk factor in insulin resistance, diabetes, dyslipidemia, hypertension, systemic inflammation, thrombosis and mortality (1-3). It has been associated to an increased risk of developing coronary heart disease (CHD) (2, 4). Nowadays, a subset of obese individuals has been described as metabolically healthy obese, since they appear to be protected from development of cardiometabolic alterations associated with obesity. These metabolically healthy but obese individuals, despite having large quantities of adipose tissue, preserve insulin sensitivity and favorable lipid profile (5-7). In the present study, our goal was to analyze if obese women with no MetS have increased cardiometabolic risk compared to non-obese women as well as observing the possible correlations between adiposity and CHD risk factors in metabolically healthy women. This is a pilot study which is descriptive, observational and cross-sectional. Two hundred sixty seven women between 20 and 40 years old who were assisted in nutritional care clinics (Belo Horizonte, Brazil) were recruited. Exclusion criteria included pregnancy, history of CHD, inflammatory or infectious disease, steroid use, hormone use except for contraceptives or drugs not related to the treatment of diabetes mellitus (8), hypertension and dyslipidemia. Among them, 189 women were eligible for the study and 99 (52.4%) agreed to participate. The study was approved by the Ethics Committees of the Federal University of Minas Gerais (ETIC217/08) and was conducted in accordance with the ethical standards of the Declaration of Helsinki. All subjects provided written informed consent. Trained health professionals performed the data collection. Information regarding age, smoking, physical activity, CHD family history, illnesses, and medications were collected. Smoking at least one cigarette per day for the previous year was considered to be current tobacco use (1). Regular exercise was classified as engaging in sports or other exercise three or more times per week (9). Body mass index (BMI) was calculated as weight in kilograms divided by height in square meters. Waist circumference (WC) was measured at the midpoint between the last rib and iliac crest (10). Body fat percentage was measured by bioelectrical impedance (Biodynamics 8.01, model 310, Brazil). Blood pressure was measured as previously recommended (11). All individuals were instructed to avoid alcohol, caffeine and cigarettes on the day before the blood collection and anthropometric assessment. Blood samples were obtained from the antecubital vein after 12h of fasting, and biochemical analysis of glucose, total cholesterol, high-density lipoprotein cholesterol (HDL-c) and trilglycerols (TAG) were performed using commercial kits (Labtest Diagnostica SA, Brazil). Low-density lipoprotein cholesterol (LDL-c) was calculated using the Friedewald equation. Kits for enzyme-linked immunosorbent assay were used to assess circulating levels of interleukin (IL)-1β and tumor necrosis factor-alpha (TNF-α) (R & D Systems, Minneapolis, MN, USA), fibrinogen and high-sensitivity C-reactive protein (hs-CRP) (Immunology Consultants Laboratory, Newberg, OR, USA). Women were categorized as obese according to BMI (BMI ≥30 kg/m2) and non-obese (BMI = 18.5-29 kg/m2) and then stratified into 3 groups: non-obese (n=41); obese with no MetS (n=30) and obese with MetS (n=28). MetS was defined according to the American Heart Association (10) as the presence of three or more of the following conditions: abdominal obesity (WC ≥88 cm), low levels of HDL-c (<50 mg/dL), hypertriglyceridemia (≥150 mg/dL), hypertension (systolic ≥130 mmHg, diastolic ≥85 mmHg), altered blood fasting glucose (≥100 mg/dL) or use of specific medication for those alterations. Metabolically healthy women were defined as those with no MetS criteria, except for increased WC. Traditional risk factors for CHD was defined as described at The Adult Treatment Panel III, and the risk of CHD over 10 years was estimated using the Framingham algorithm (12). Diabetes mellitus was defined as plasma fasting glucose ≥126 mg/dL or use of insulin or other hypoglycemic agents and categorized as a coronary event equivalent (12). The sample size was calculated considering the prevalence of MetS and obesity in the Brazilian population (13) and based on the requirements of a minimal significant difference equal to one standard deviation and 90% power. A sample size of 27 patients per study group was determined. The data were assessed by the D'Agostino-Pearson test, following ANOVA, Bonferroni and t tests for parametric data or Kruskal-Wallis, Dunn and Mann-Whitney tests for non parametric data. Continuous variables were presented as media and standard error or median and interquartile range. Categorical variables were represented as frequencies after chi-square or Fisher exact test analyses. Spearman correlation coefficients were calculated to evaluate correlations between adiposity and risk factors. The level of significance of 5% was considered significant. To avoid bias, women in use of hypoglycemic and antihypertensive agents were excluded from analyses of continuous variables and their correlations. In the following analysis, only obese and non-obese metabolically healthy women with no alterations of blood pressure, blood lipids and glucose were compared, 13 and 33 women in each group, respectively. The data were analyzed using a Minitab version 15 or GraphPad Prism software 7.0. All 99 voluntaries completed the experiment. The use of hypoglycemic drugs and contraceptives were similar among groups, although the use antihypertensive agents were more frequent in obese women with MetS group. None of the women were in use of antilipidemic agents. The frequency of class I, II and II obesity were similar between obese women’s groups and more than 65% were classified as class I obesity (data not shown). All parameters not related to MetS as well as hs-CRP were similar between both obese individuals’ groups (Table 1). TNF-α was not detected in subject from all groups. * Data are presented as media ‡ standard error (ANOVA and Bonferroni tests) or median ‡ interquartile range (Kruskal-Wallis and Dunn tests). ‡ Women using medication for treatment of these diseases were excluded from analysis of blood glucose (n = 1, 1 and 4 women) and blood pressure (n = 2, 2 and 9 women). Different letters in the same row represent statistical difference between groups. HDL = high-density lipoprotein, MetS = metabolic syndrome. Regarding the components of MetS, diastolic and systolic blood pressures were statistically different among three groups (Table 1). On the other hand, glycemia and HDL-c levels were similar in both groups with no MetS and lower than those seen in women with MetS. Despite its relevance as a component of MetS, hypertriglyceridemia was similar in all groups (Table 1). When all women, with and with no medications, were compared, the statistical differences were kept the same for all parameters (data not shown). The frequency of hypertension and increased WC were higher in obese individuals with no MetS compared to non-obese group. Nonetheless, the frequencies of other MetS components (hypertriglyceridemia and low HDL-c, hyperglycemia) were similar in non-obese and obese women with no MetS (Table 2). The frequency of major cardiovascular risk factors that were not components of MetS was also analyzed. Once again, nonobese and obese women with no MetS presented similar results (Table 2). High HDL-c, an atheroprotective factor, was seen only in non-obese and obese women with no MetS groups. DM, smoking, LDL-c above optimal levels and physical inactivity were similar among three groups (Table 2), although positive family history of CHD strongly tended to be higher in obese with MetS (p=0.058) compared to non-obese group. * Data are presented as percentage (number of individuals) (chi-square or Fisher exact tests) or media standard error (ANOVA and Bonferroni tests). ‡ Measured or self-reported use of medications for this disease. ¦ Factors that were not involved in metabolic syndrome diagnostic high HDL-c > 60 mg/dL LDL-c above optimal level > 130 mg/dL. ** Self reported or fasting glycemia > 126 mg/dL. Different letters in the same row represent statistical difference between groups. CHD = coronary heart diseases, HDL-c = high-density lipoprotein cholesterol, LDL-c = low-density lipoprotein cholesterol, MetS = Metabolic Syndrom. The presence of MetS, as expected, increased the probability of finding two or more risk factors for CHD. Nevertheless, the frequency of two or more risk factors was similar in obese with no MetS and nonobese groups. 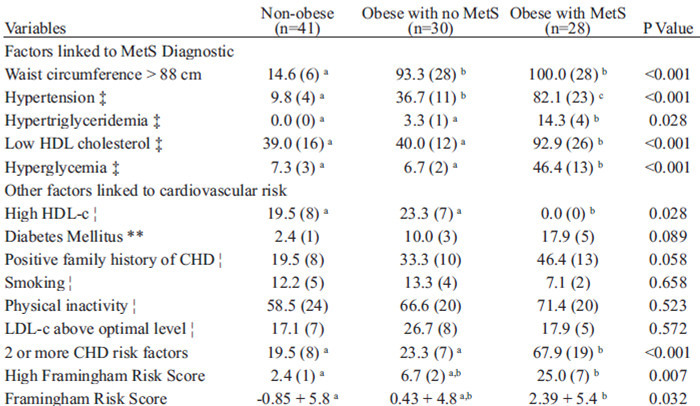 In the same way, 25% of obese women with MetS had a high CHD risk according to Framingham Risk Score, while only 2.4% of non-obese and 6.7% of obese women with no MetS presented such risk (Table 2). Likewise, Framingham Risk Score was not statistically different when obese with no MetS and non-obese women were compared (Table 2). The Spearman correlation showed that WC, a marker of visceral adiposity, was correlated to MetS components (blood pressure, triacylglycerol, HDL-c) whilst also correlated to hs-CRP. The later was the only inflammatory marker significantly correlated to WC (Figure 1). The total adiposity also correlated with these risk factors (data not shown). To explore the effect of adiposity on cardiovascular risk, obese and non-obese women metabolically healthy were compared. The results showed that far from anthropometric parameters and blood pressure, only hs-CRP was statistically higher in obese group (Table 3). The result of Spearman correlation showed total adiposity was positively correlated to blood pressure and hs-CRP in metabolically healthy women (Figure 2). WC correlated only to blood pressure (data not shown). In the present study, young women presenting obesity associated to MetS, obesity with no MetS and non-obese were compared. It was evinced that obese individuals with no MetS presented CHD risk factor levels and frequency closer to non-obese women. Between 37% and 40% of obese women with no MetS presented hypertension and low HDL-c concentration, respectively, while in those with MetS these numbers increased to 82% and 93%, respectively. HDL-cholesterol is a common point linking MetS and CHD. More than 50% of the individuals participating in this study had low levels of HDL-c and the frequency was similar in both groups with no MetS. Moreover, high HDL-c was observed in obese individuals with no MetS and in non-obese groups (23.3 and 19.5%, respectively); however, it was absent in obese women with MetS. As a consequence, there was a reduction in the number of risk factors in obese individuals with no MetS group due to high HDL-c, an important atheroprotective factor. Hypertriglyceridemia is an established cardiovascular risk factor, however few women in our study had this metabolic alteration. Blood pressure was the only parameter statistically different among the three groups. As in this study, other studies have demonstrated the influence of obesity (14, 15) and visceral fat (1) on hypertension. Thus, the adverse effects of increased visceral fat content on vasodilatation, sodium reabsorption, sympathetic nervous system activation (16) and increased expression of angiotensinogen (17) explain the higher frequency of hypertension in both obese groups. The obese women with no MetS had intermediate frequency of Framingham Risk Score classified as high; however, it was about 3 times higher in the obese individuals with MetS group. Nevertheless, similar results were seen by Kip et al. (14) using data from the Women's Ischemia Syndrome Evaluation (WISE) study. They showed that obese women with a normal metabolism have a low cardiovascular risk; whereas, lean women with MetS have a high risk. Kip et al. (14) evinced that despite the strong association between MetS and BMI, only MetS was significantly correlated with CHD, suggesting that metabolic changes must have a more important role than obesity in the risk stratification of CHD in women. The association between WC, visceral adiposity, inflammation and atherosclerosis (1, 17) is well known. In this study, WC correlated with blood pressure, HDL-c, TAG and hs-CRP but it was not related to fibrinogen and IL-1β, other important inflammatory markers. These results are in agreement with other studies reporting the correlation of WC, body fat and waist-to-hip ratio with hs-CRP (3, 18). The CRP is a sensitive marker for systemic inflammation thus these findings suggest a state of low-grade systemic inflammation in persons with excess body fat. The definition of metabolically healthy obese (MHO) individuals is not unanimous (5, 6, 8, 19, 20) and, consequently, its prevalence is still unknown (6, 8, 19, 21). The concept of MHO subjects has generated doubts about the influence of adiposity in the CHD risk. However, obese individuals who are not affected by MetS cannot be automatically classified as MHO, since they could present up to two metabolic alterations related to MetS. For this reason, in a second step, only metabolically healthy obese and non-obese women were compared to evaluate the correlation of adiposity per se and CHD risk factors. The results of this study evidenced that the prevalence of metabolically healthy women was 43.3% among obese with no MetS and 80.5% among non-obese women. This data is in agreement with another study analyzing 2,803 women that showed a prevalence of MHO ranging between 11.4 and 43.3% according to the MHO criteria used (21). Some reports have shown that frequency of CHD events in MHO is comparable to the normal weight individuals (6, 22). However, other studies showed that MHO patients still have some increase of CHD risk compared to healthy non-obese individuals and will benefit by weight loss treatment (7, 23). Comparing metabolically healthy non-obese and obese individuals, glycemia, triglyceridemia, HDL-c, fibrinogen and IL-1β levels were similar among groups. It could be argued that the low sample size of MHO women could limit the interpretation of the results of this study; nevertheless, not even a trend was observed amongst data related to MetS or adiposity comparing both metabolically healthy groups. The presence of obese individuals who maintain a low cardiometabolic risk suggests that some obese people are less responsive to increased secretion of adipokines or that their ability of the adipose tissue to secrete adipokines is reduced (8, 24). Although studies have demonstrated that MHO is linked to low cardiometabolic risk (8, 20), our results do not suggest that MHO is a risk free condition, since adipose tissue expansion was correlated to blood pressure and hs-CRP levels. Based on the results of this study as well as other results (23, 25), perhaps MHO still carries a potential risk of CHD, justifying the weight loss to get additional improvement of cardiometabolic risk factors. Obese women with no MetS exhibited CHD risk similar to those seen in non-obese women. However, since blood pressure and hs-CRP levels are still correlated to fat tissue expansion in metabolically healthy women, this reinforces the role of obesity in the development of CHD. Fox CS, Massaro JM, Hoffmann U, Pou KM, Maurovich-Horvat P, Liu CY, et al. Abdominal visceral and subcutaneous adipose tissue compartments: association with metabolic risk factors in the Framingham Heart Study. Circulation. 2007;116(1):39-48. Murphy NF, MacIntyre K, Stewart S, Hart CL, Hole D, McMurray JJ. Long-term cardiovascular consequences of obesity: 20-year follow-up of more than 15 000 middle-aged men and women (the Renfrew-Paisley study). Eur Heart J. 2006;27(1):96-106. Visser M, Bouter LM, McQuillan GM, Wener MH, Harris TB. Elevated C-reactive protein levels in overweight and obese adults. JAMA. 1999;282(22):2131-5. Kurth T, Gaziano JM, Rexrode KM, Kase CS, Cook NR, Manson JE, et al. Prospective study of body mass index and risk of stroke in apparently healthy women. Circulation. 2005;111(15):1992-8. Brochu M, Tchernof A, Dionne IJ, Sites CK, Eltabbakh GH, Sims EA, et al. What are the physical characteristics associated with a normal metabolic profile despite a high level of obesity in postmenopausal women? J Clin Endocrinol Metab. 2001;86(3):1020-5. Calori G, Lattuada G, Piemonti L, Garancini MP, Ragogna F, Villa M, et al. Prevalence, metabolic features, and prognosis of metabolically healthy obese Italian individuals: the Cremona Study. Diabetes Care. 2011;34(1):210-5. Primeau V, Coderre L, Karelis AD, Brochu M, Lavoie ME, Messier V, et al. Characterizing the profile of obese patients who are metabolically healthy. Int J Obes (Lond). 2011;35(7):971-81. Wildman RP, Muntner P, Reynolds K, McGinn AP, Rajpathak S, Wylie-Rosett J, et al. The obese without cardiometabolic risk factor clustering and the normal weight with cardiometabolic risk factor clustering: prevalence and correlates of 2 phenotypes among the US population (NHANES 1999-2004). Arch Intern Med. 2008;168(15):1617-24. Imamura T, Doi Y, Arima H, Yonemoto K, Hata J, Kubo M, et al. LDL cholesterol and the development of stroke subtypes and coronary heart disease in a general Japanese population: the Hisayama study. Stroke. 2009;40(2):382-8. Grundy SM, Cleeman JI, Daniels SR, Donato KA, Eckel RH, Franklin BA, et al. Diagnosis and management of the metabolic syndrome: an American Heart Association/National Heart, Lung, and Blood Institute scientific statement: Executive Summary. Crit Pathw Cardiol. 2005;4(4):198-203. Chobanian AV, Bakris GL, Black HR, Cushman WC, Green LA, Izzo JL, Jr., et al. Seventh report of the Joint National Committee on prevention, detection, evaluation, and treatment of high blood pressure. Hypertension. 2003;42(6):1206-52. National Cholesterol Education Program (NCEP). Third report of the National Cholesterol Education Program (NCEP) expert panel on detection, evaluation, and treatment of high blood cholesterol in adults (Adult Treatment Panel III) final report. Circulation. 2002;106(25):3143-421. Salaroli LB, Barbosa GC, Mill JG, Molina MC. Prevalence of metabolic syndrome in population-based study, Vitoria, ES-Brazil. Arq Bras Endocrinol Metabol. 2007;51(7):1143-52. Kip KE, Marroquin OC, Kelley DE, Johnson BD, Kelsey SF, Shaw LJ, et al. Clinical importance of obesity versus the metabolic syndrome in cardiovascular risk in women: a report from the Women's Ischemia Syndrome Evaluation (WISE) study. Circulation. 2004;109(6):706-13. Lee K, Lee S, Kim YJ. Waist circumference, dualenergy X-ray absortiometrically measured abdominal adiposity, and computed tomographically derived intraabdominal fat area on detecting metabolic risk factors in obese women. Nutrition. 2008;24(7-8):625-31. Dusserre E, Moulin P, Vidal H. Differences in mRNA expression of the proteins secreted by the adipocytes in human subcutaneous and visceral adipose tissues. Biochim Biophys Acta. 2000;1500(1):88-96. Bochud M, Marquant F, Marques-Vidal PM, Vollenweider P, Beckmann JS, Mooser V, et al. Association between C-reactive protein and adiposity in women. J Clin Endocrinol Metab. 2009;94(10):3969-77. Messier V, Karelis AD, Prud'homme D, Primeau V, Brochu M, Rabasa-Lhoret R. Identifying metabolically healthy but obese individuals in sedentary postmenopausal women. Obesity (Silver Spring). 2010;18(5):911-7. Shea JL, Randell EW, Sun G. The prevalence of metabolically healthy obese subjects defined by BMI and dual-energy X-ray absorptiometry. Obesity (Silver Spring). 2011;19(3):624-30. Velho S, Paccaud F, Waeber G, Vollenweider P, Marques-Vidal P. Metabolically healthy obesity: different prevalences using different criteria. Eur J Clin Nutr. 2010;64(10):1043-51. Song Y, Manson JE, Meigs JB, Ridker PM, Buring JE, Liu S. Comparison of usefulness of body mass index versus metabolic risk factors in predicting 10-year risk of cardiovascular events in women. Am J Cardiol. 2007;100(11):1654-8. Janiszewski PM, Ross R. Effects of weight loss among metabolically healthy obese men and women. Diabetes Care. 2010;33(9):1957-9. Barbarroja N, Lopez-Pedrera R, Mayas MD, Garcia-Fuentes E, Garrido-Sanchez L, Macias-Gonzalez M, et al. The obese healthy paradox: is inflammation the answer? Biochem J. 2010;430(1):141-9. Bot M, Spijkerman AM, Twisk JW, Verschuren WM. Weight change over five-year periods and number of components of the metabolic syndrome in a Dutch cohort. Eur J Epidemiol. 2010;25(2):125-33.